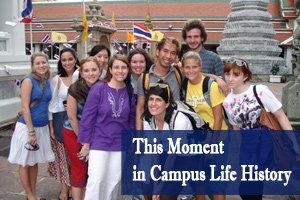 Students explore the Thai-Burma border in 2008, continuing a history of social justice engagement with Alternative Breaks. Since 1998, some 1,500 AU students have gone into the world in a unique way. They’ve gone from the southern tip of Africa and the mountains of Nepal to the city streets of San Francisco and the fields of America’s Corn Belt. They’ve explored issues of youth and women’s empowerment in Haiti. They’ve visited settlements in Kenya, refugee camps in Israel, and classrooms in Cuba. They’ve built deep and long-term commitments with nonprofit organizations, continuing to learn and engage with these groups each year. They’ve taken their learning from the classroom into real-world experience. They’ve gone on Alternative Breaks trips. University chaplain Joe Eldridge went with them on the first Alt Breaks trip abroad in 1999. After Hurricane Mitch ravaged the country, Eldridge hung a poster in the Kay Spiritual Life Center, and a group of twelve went to Honduras to learn how a nation rebuilds itself. At first, they went organized and led only by themselves. Andrew Willis Garcés went with them to Mexico in 2002 and 2003 before leading them to Cuba in 2004 – back when they were a student organization: the Alternative Breaks Club. As he earned a BA in International Relations and an MA in International Peace & Conflict Resolution, they were the largest student-run organization on campus at the time, with an annual budget of $180,000 and another $60,000 donated to partner organizations abroad and at home. Since then, they’ve organized through the Center for Community Engagement & Service (CCE&S). Campus Life staff member Kristina Thompson has been around Alt Break trips for the past ten years, watching them develop in some ways and stay steadfast in ways unique to AU. Now, under the guidance of CCE&S’s assistant director of global learning and leadership Shoshanna Sumka, over 150 of them go on trips running in the winter, spring, and summer each year. Their focus, however, extends beyond that week or more of experience. They’ve taken that process to heart. They’ve become nonprofit leaders, teachers, and active citizens. They’ve gone on to affect change in the world. “Alt Break has created a generation of student activists that became real-world activists,” says Garcés, who’s taken his Alt Breaks experiences into grassroots activism in Texas. Before Elena Rubinfeld graduated from AU’s School of International Service in 2008, she went with them to Honduras and led them to Bolivia and Colombia in 2007 and 2008 to examine human rights and development issues. After graduation, she joined the Peace Corps in El Salvador and now works in immigrant rights issues. With 68 just returned from spring trips to Puerto Rico, Pennsylvania, Northern Ireland and elsewhere, they continue going out into the world. They continue engaging in issues of social justice that will carry into the classroom and their lives beyond it. And, in doing so, they continue to build an Alternative Breaks program that has come to define AU just as much as it defines them.